"The bread is so tasty, my kids think it's homemade!" Back in 1960, you could buy a loaf of bread for 20 cents. Times have changed, but you can still find good, old-fashioned baked bread. 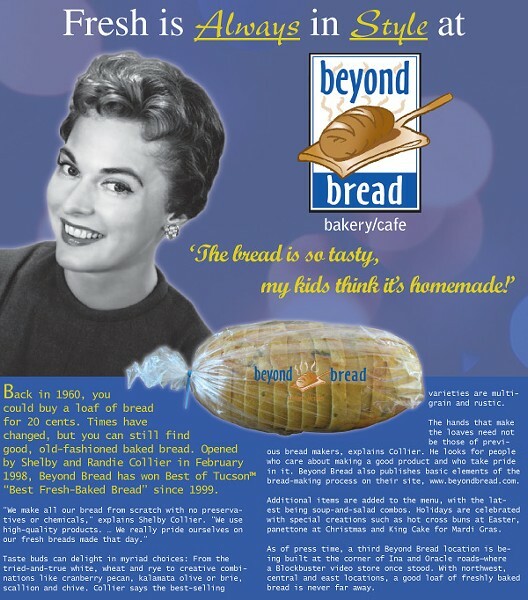 Opened by Shelby and Randie Collier in February 1998, Beyond Bread has won Best of Tucson™ "Best Fresh-Baked Bread" since 1999. "We make all our bread from scratch with no preservatives or chemicals," explains Shelby Collier. "We use high-quality products. ... We really pride ourselves on our fresh breads made that day." varieties are multigrain and rustic. The hands that make the loaves need not be those of previous bread makers, explains Collier. He looks for people who care about making a good product and who take pride in it. Beyond Bread also publishes basic elements of the bread-making process on their site, www.beyondbread.com. Additional items are added to the menu, with the latest being soup-and-salad combos. Holidays are celebrated with special creations such as hot cross buns at Easter, panettone at Christmas and King Cake for Mardi Gras. As of press time, a third Beyond Bread location is being built at the corner of Ina and Oracle roads—where a Blockbuster video store once stood. With northwest, central and east locations, a good loaf of freshly baked bread is never far away.